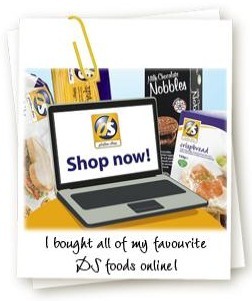 DS or Dietary Specials make my all time favourite gluten free foods. The gluten free product I buy the most of, by far, is DS Brown Ciabatta Rolls. I slice them lengthways into 3's to make toast, I make bacon sarnies and fish finger sarnies with them, I make tomato and cheese toasties with them and I think they're great for cheese and salad sandwiches. I also think the pizza bases are fantastic and probably the best out there. I love a crunchy crust and DS's have a great texture. I was recently made aware that DS are offering free delivery on all UK orders, so I went a bit mad and got all my faves and few extras that I haven't tried before. After munching my way through digestives, custard creams, lunch rolls, crispbread, lasagne and cornflakes I must say that the quality is always brilliant. You don't get holey bread, crumbling to bits when you breath on it produce. It's all well made, the flavours are spot on and you can just rely on them to do what they say on the tin. Many of the items are also egg free and or milk free too.